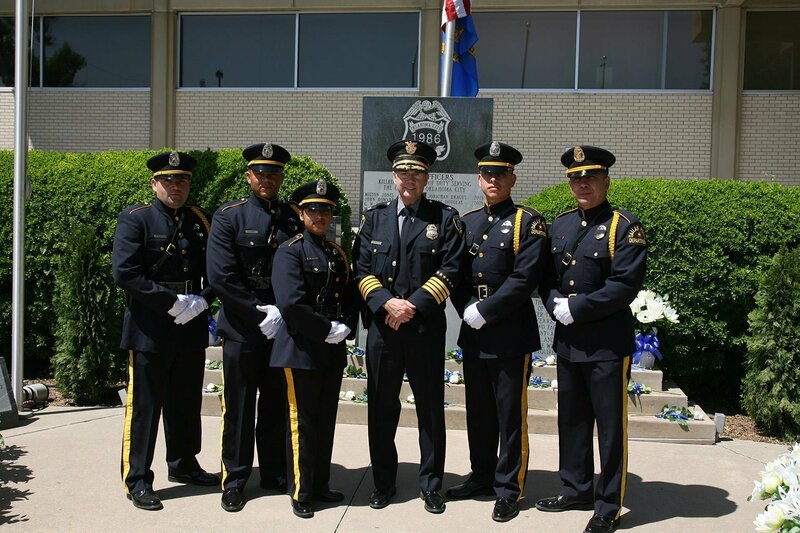 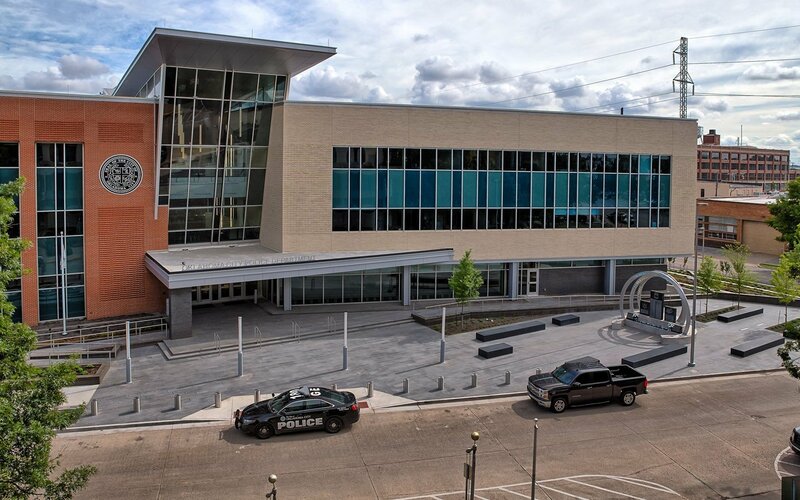 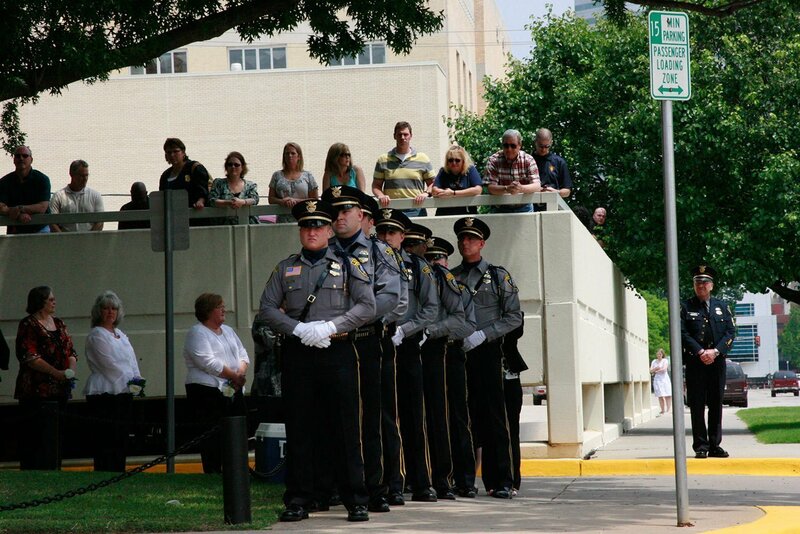 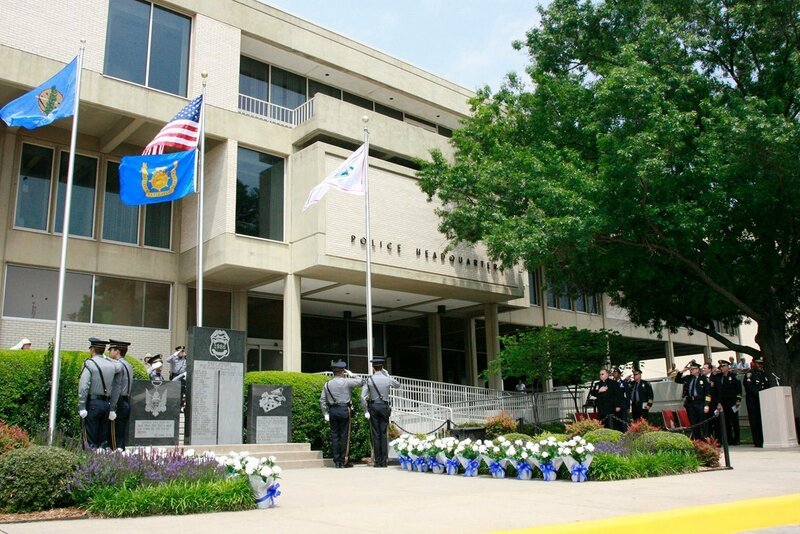 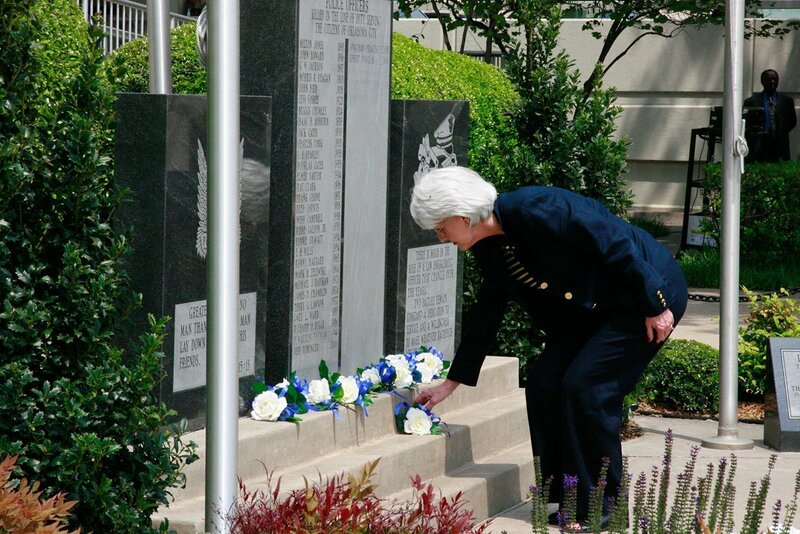 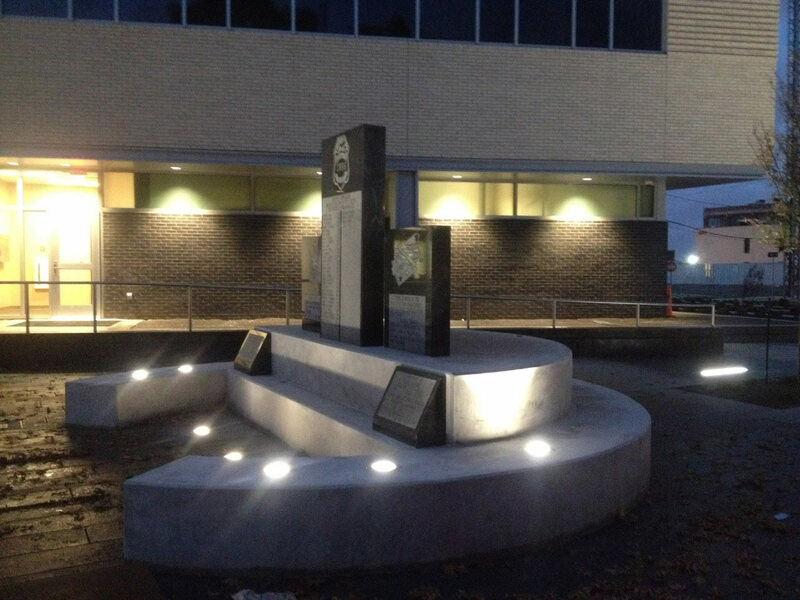 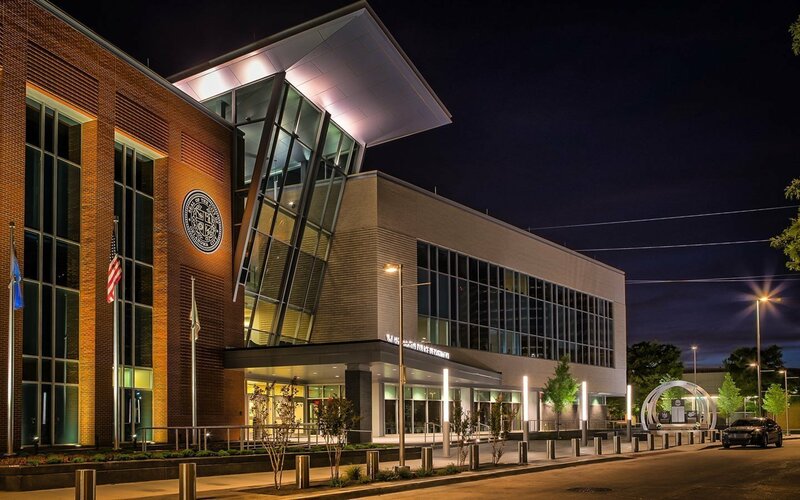 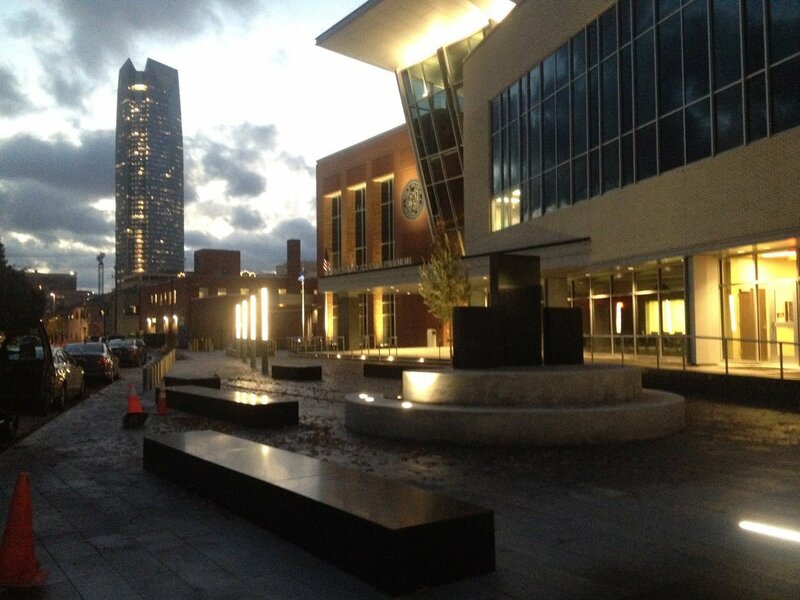 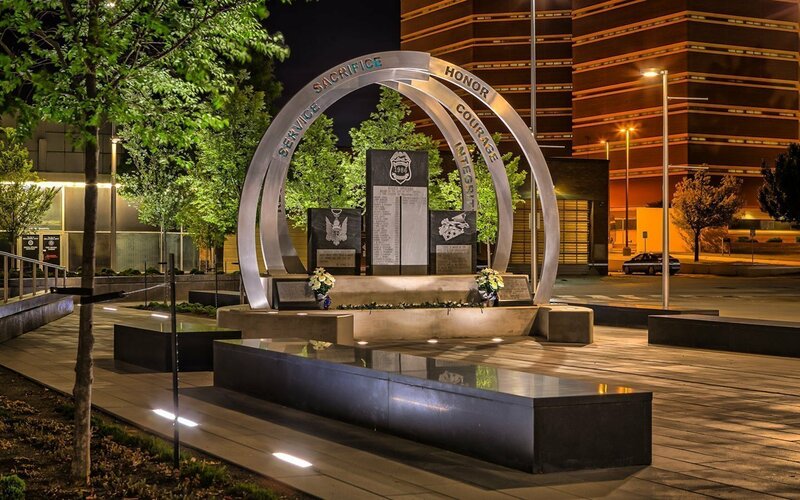 When Huether was selected to create a new public memorial for Oklahoma City’s new 89,000-square-foot, $22 million police headquarters, he responded by working collaboratively with City officials and representatives of Oklahoma City’s Police Department to create a work that not only memorializes fallen officers but honors members of the City’s police force who work diligently to protect citizens everyday. 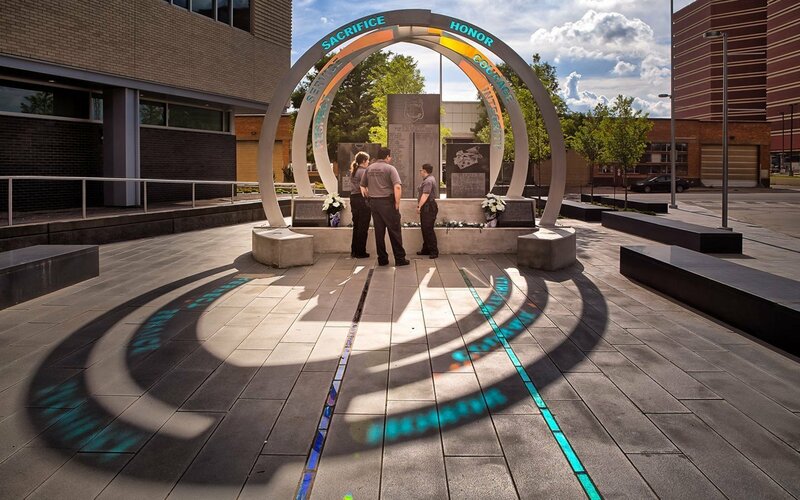 Tasked with integrating historic memorial monuments into the new artwork, Huether decided to make the stones a central focus of his installation and create an installation that serves as both a community gathering space and a site for civic events. 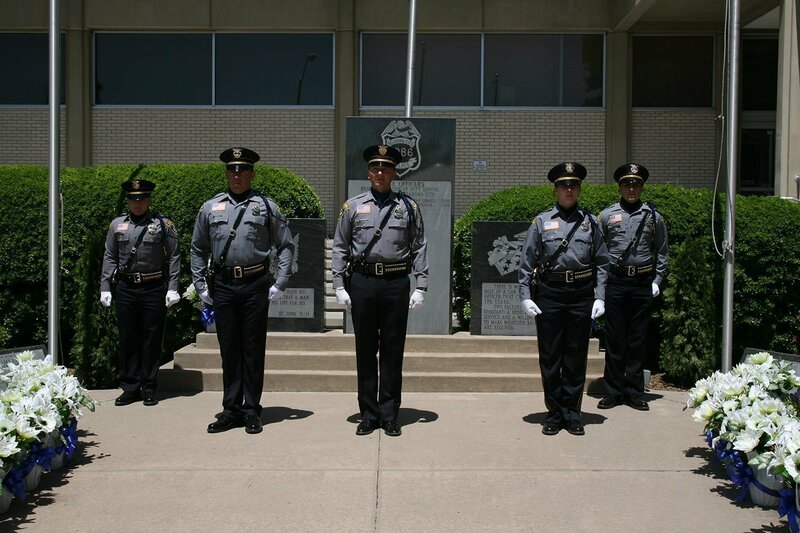 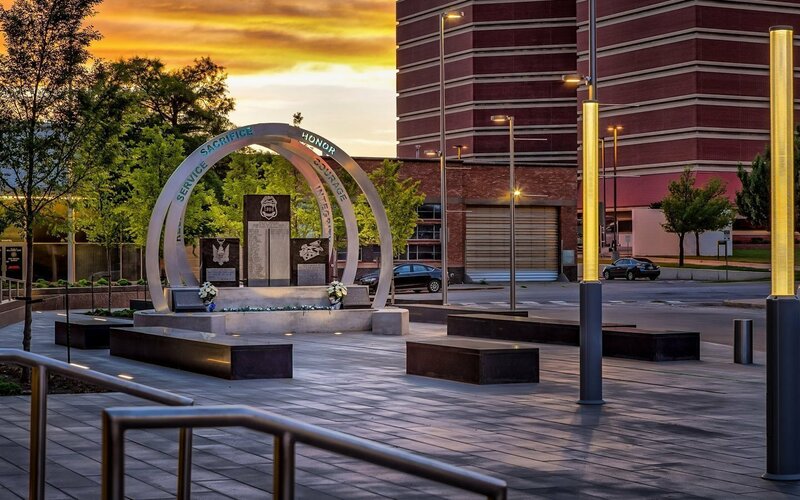 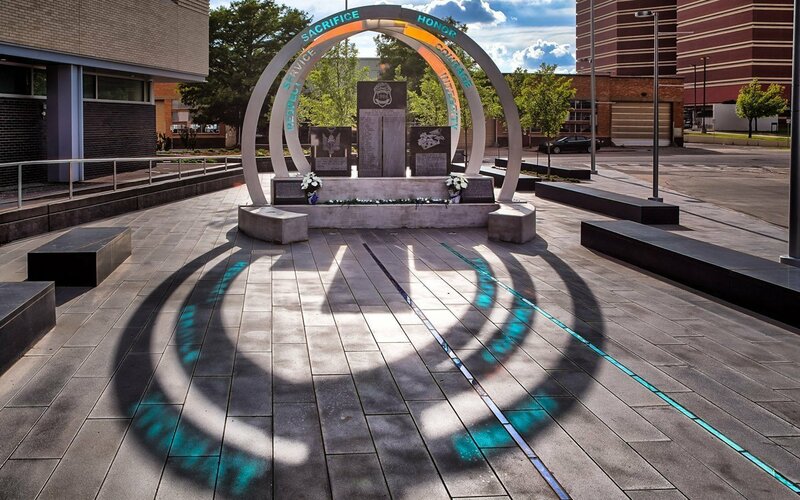 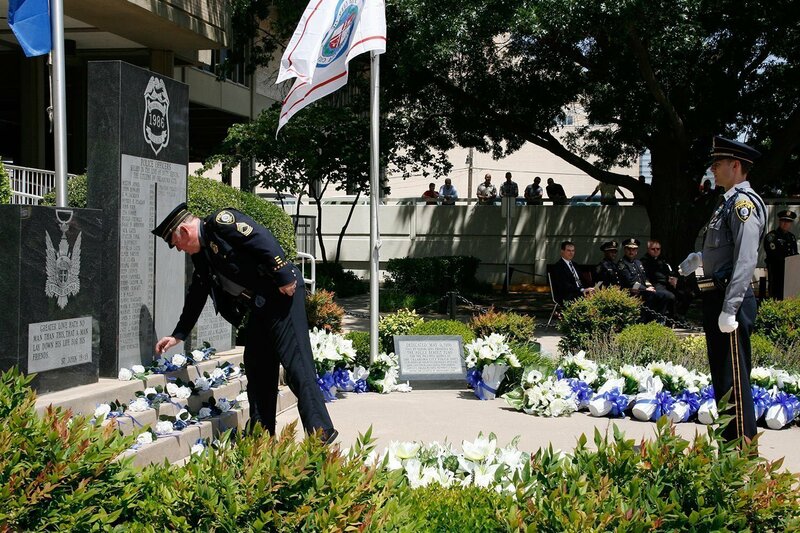 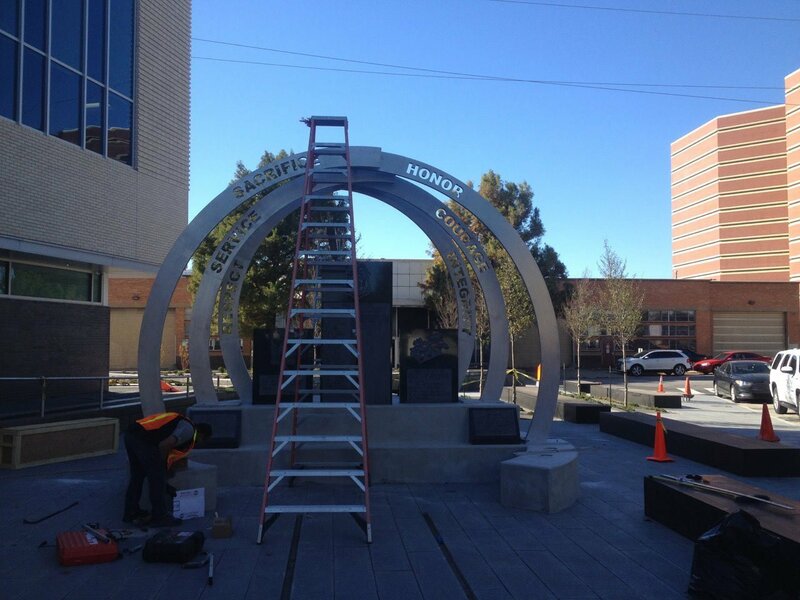 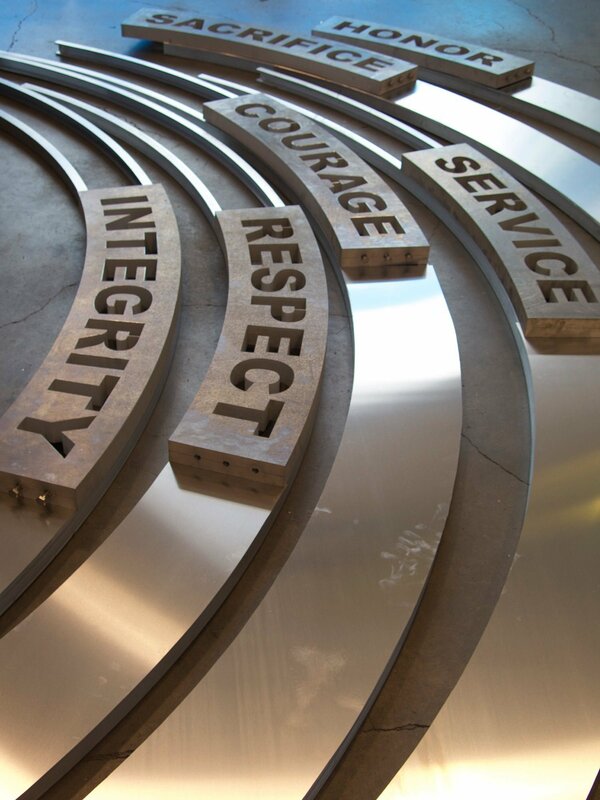 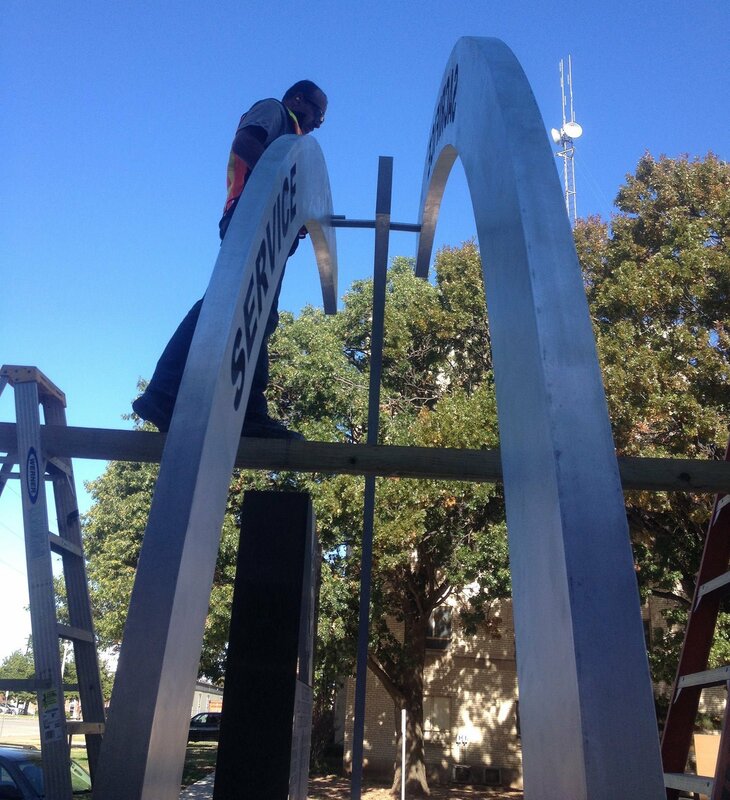 The Oklahoma City Police Department Memorial is composed of six aluminum arches that curve towards one another, creating an uplifting gesture while pulling focus towards three memorial stones placed beneath. 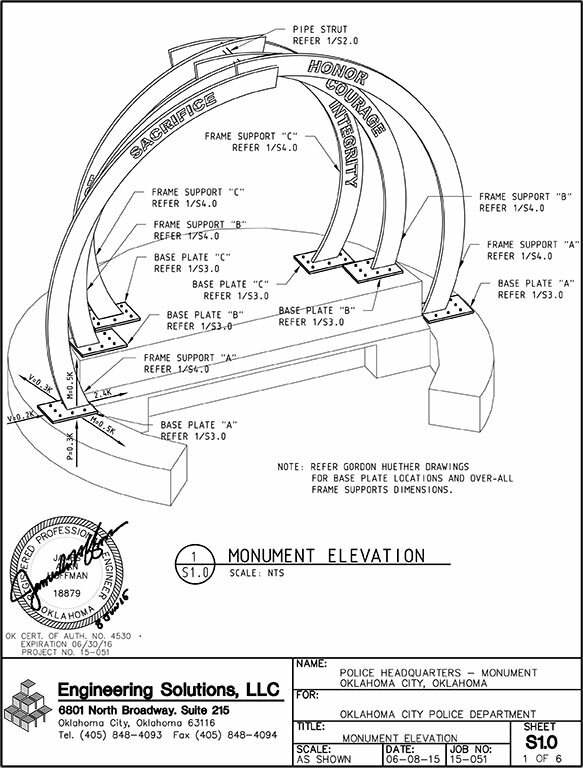 The arches and monuments are placed on an elevated, circular and stepped dais with a twelve-foot diameter on the top step and an eighteen-foot diameter base. 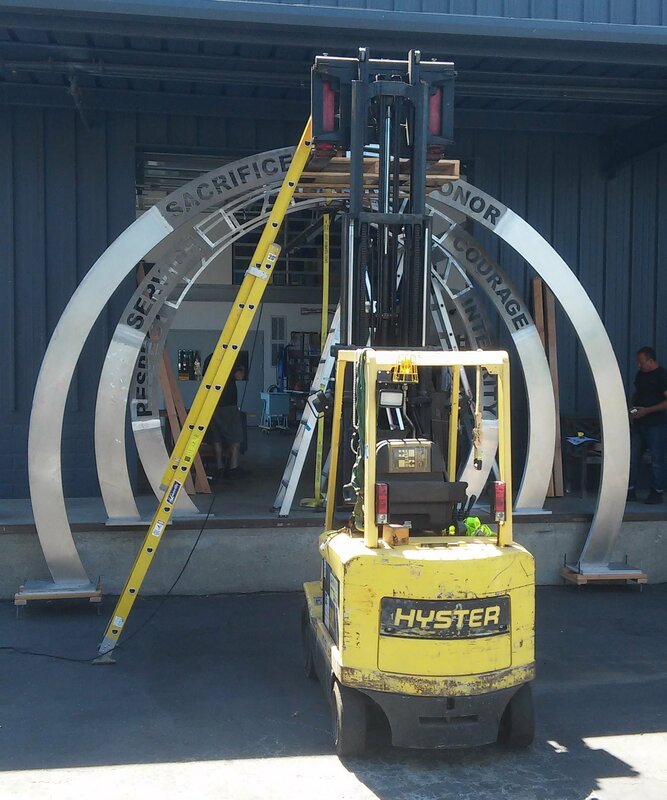 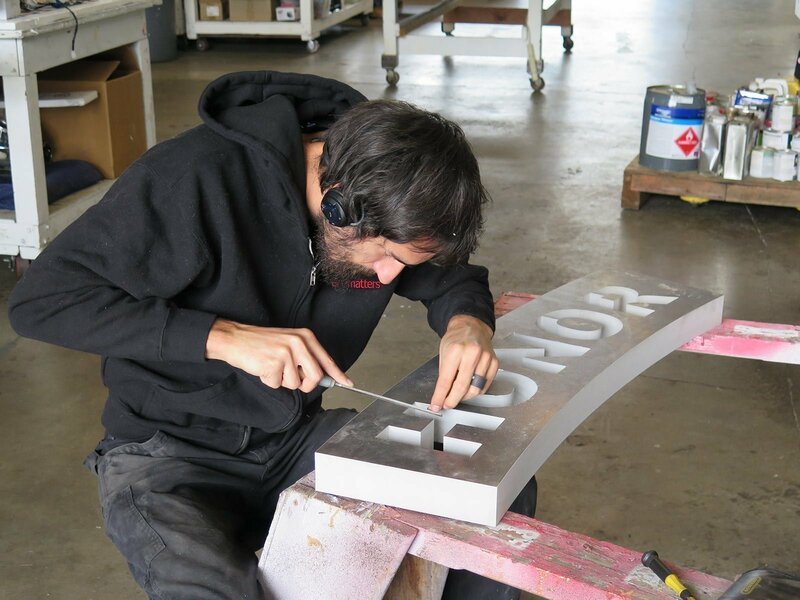 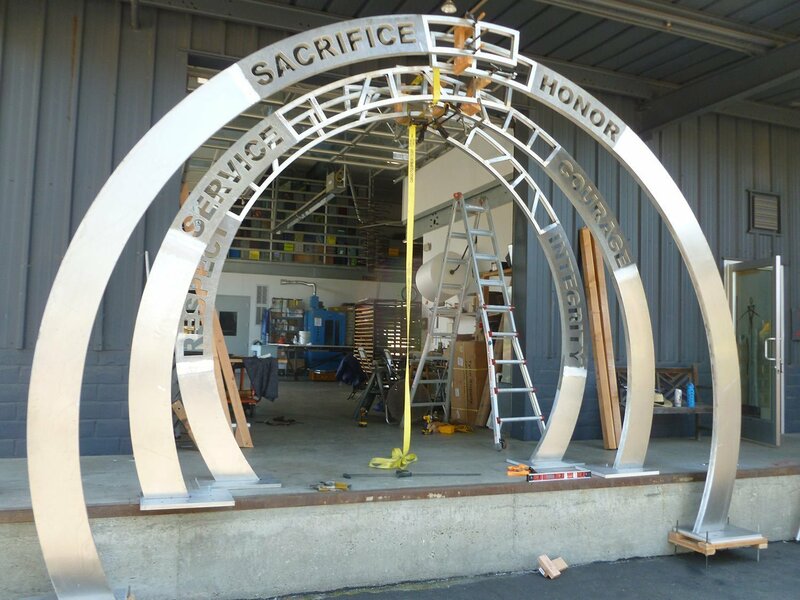 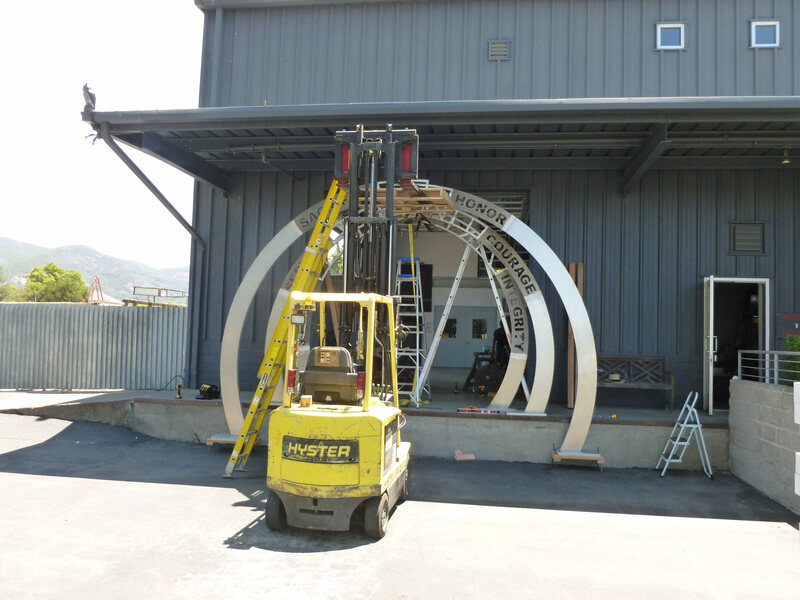 Each arch has one word water-jet-cut onto its surface with an inset of blue and gold dichroic glass behind it. 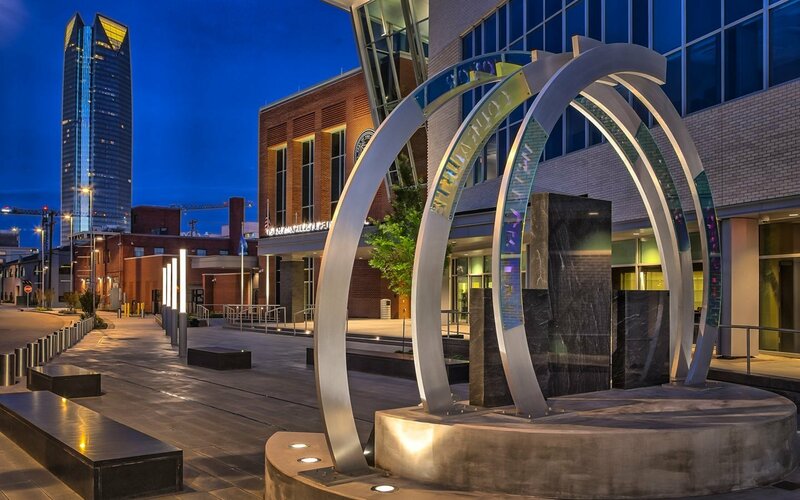 Dichroic glass is a highly reflective, light sensitive, intensely colored glass that changes in color dependent on the angle of vision and light. 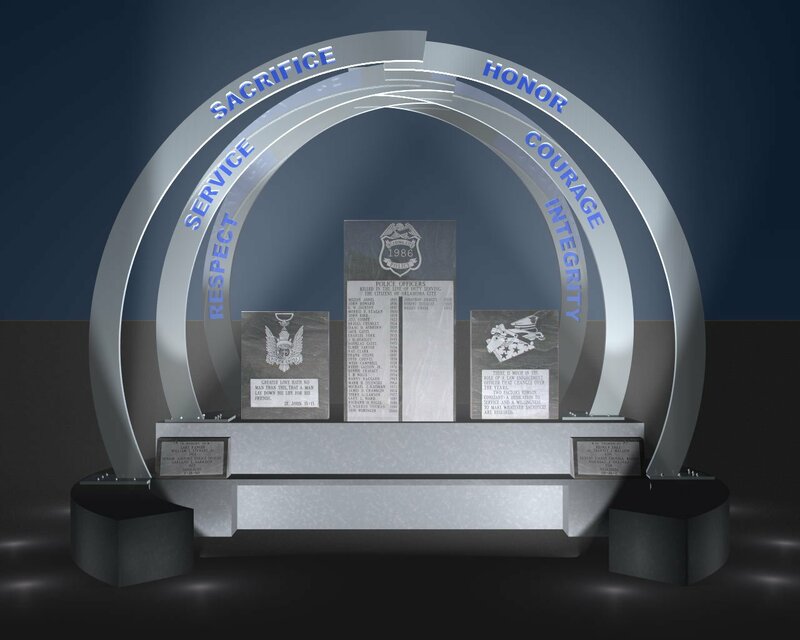 The words: Strength, Honor, Courage, Responsibility, Integrity and Respect are touchstones for the police force and blue and gold are the colors of the uniform. 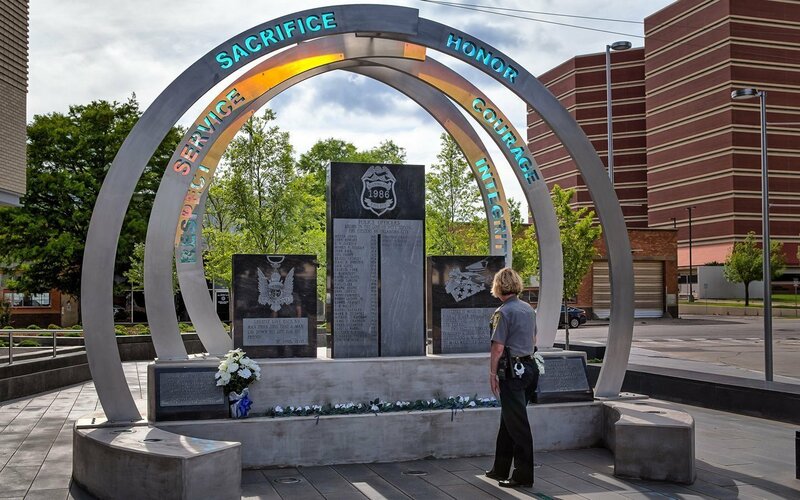 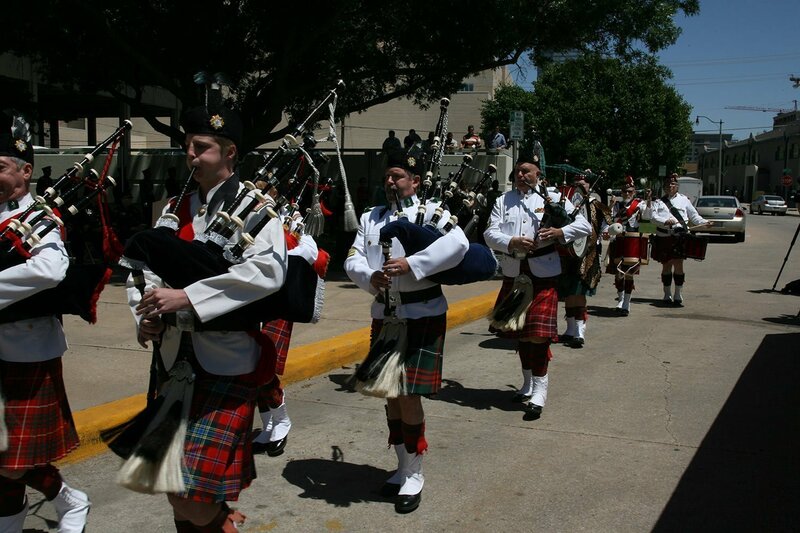 The arrangement of arches creates an open-aired canopy and a gesture that serves as an embrace of our fallen officers. 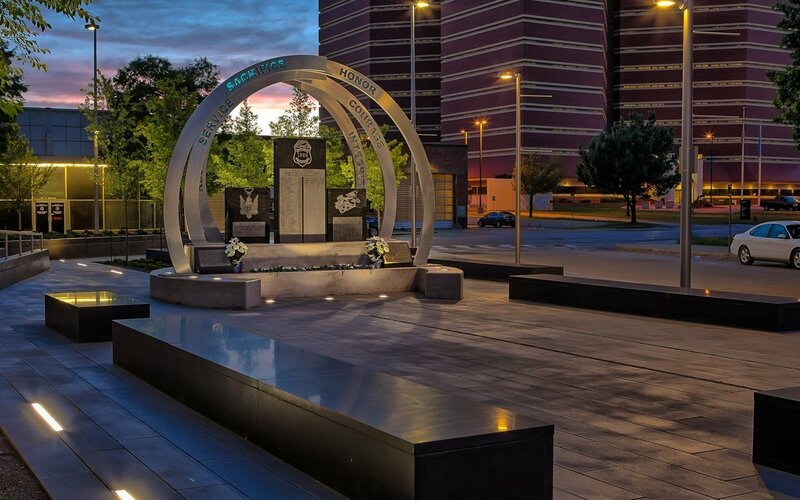 The circular steps provide a place for flowers and wreaths during the memorial event and a place for contemplation or rest throughout the rest of the year. 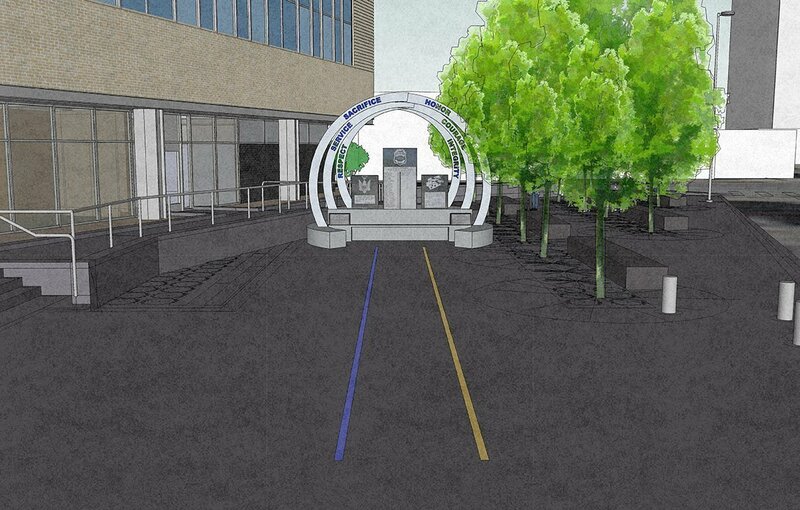 The second part of Huether’s installation creates a path along the plaza’s axis. 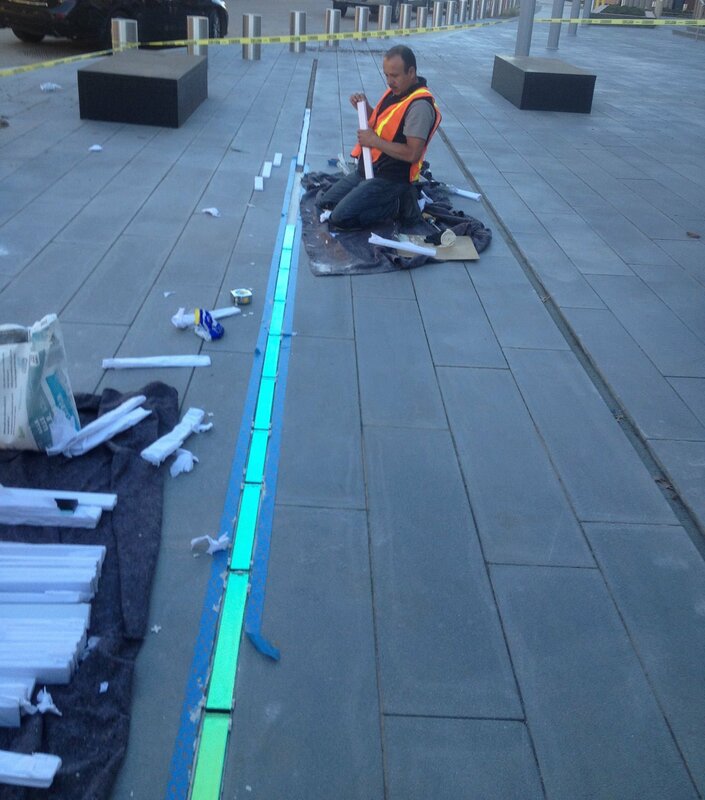 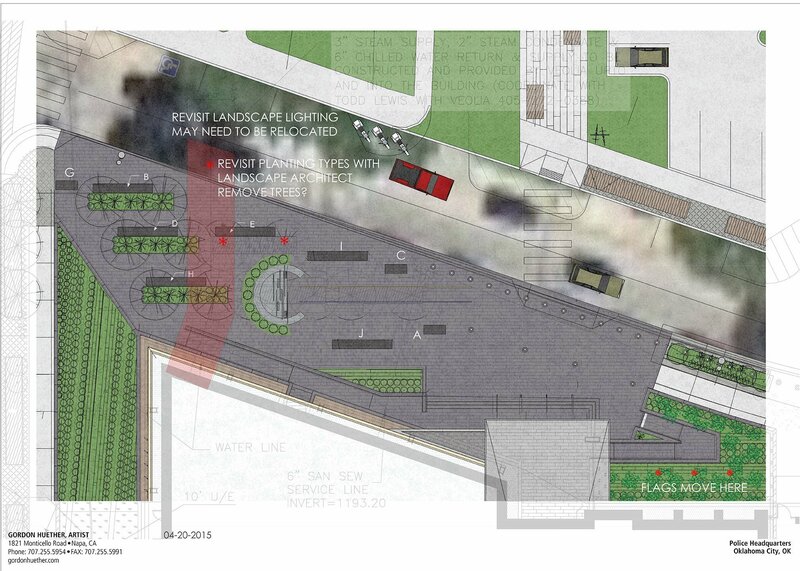 Two paths of dense, fused glass, one in blue and the other in gold, are embedded into the plaza surface. 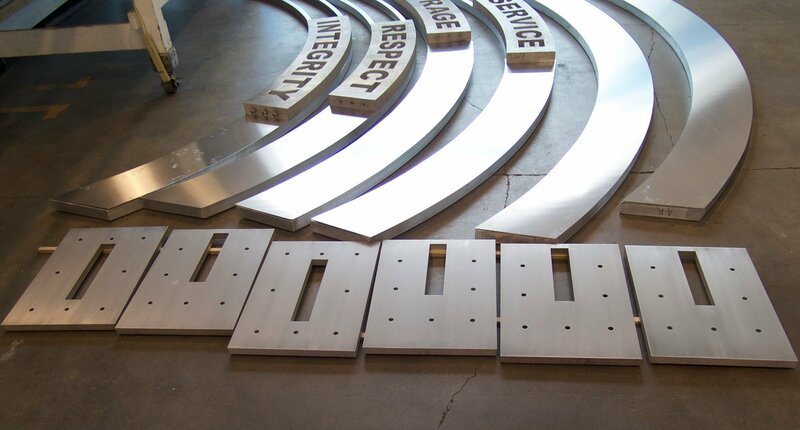 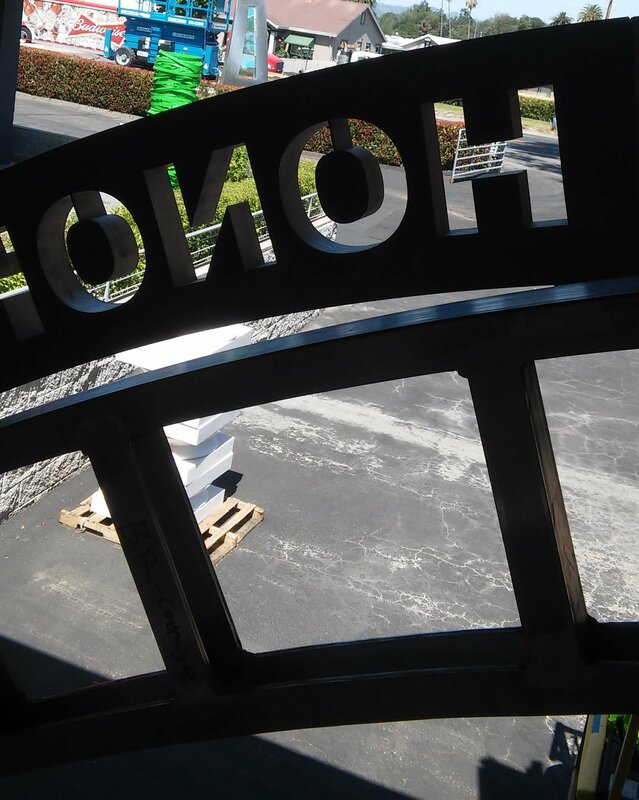 Each band is two inches wide and runs for a total of 70 feet with fluctuating placement that creates a stepping stone effect. 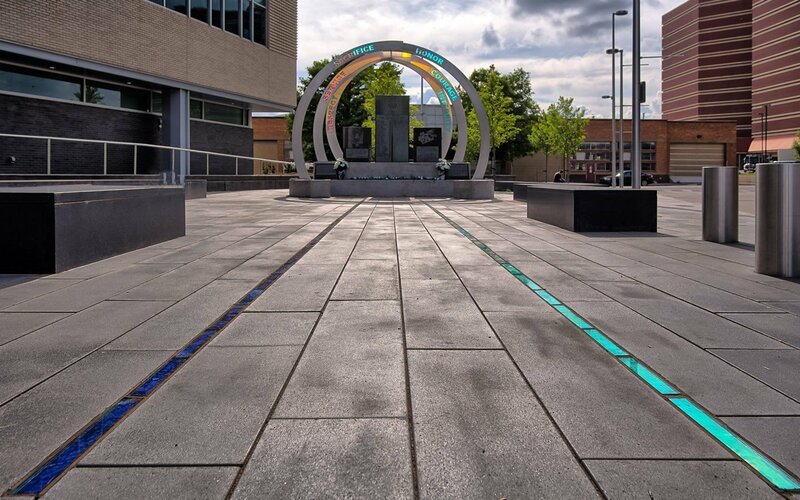 This glass path serves as a way-finder for visitors, underscores the processional aspect of the memorial and adds additional beauty and complexity to the plaza. 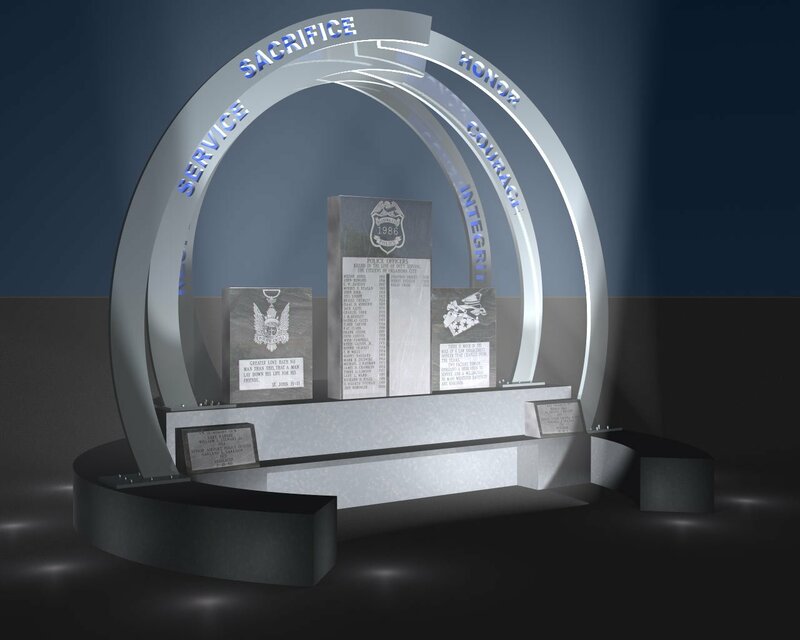 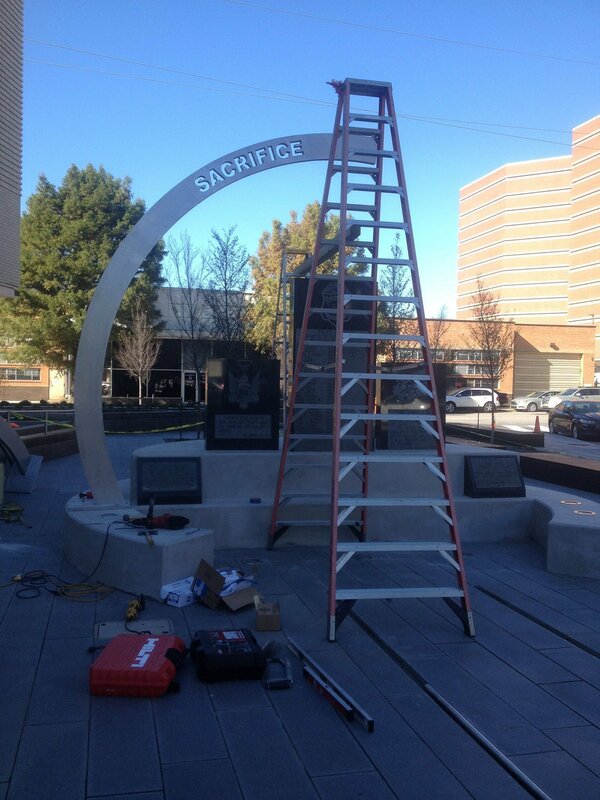 There is an inherent dignity and evocation of honor present in this installation.